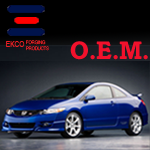 Ekco Forging Products Co.,Ltd. stand on 1/101 moo 2, rama II Rd. Tambol Thasai, Amphur Muang, Samutsakhorn 74000 Thailand.. Tel. 66 (034) 490335-6, Fax. (034) 829183 e-mail: ekcofg@cscoms.com Ekco Forging Products Co.,Ltd. have been situated for small industry since 1989. We continuously develop and increase in production capacity. Nowadays we become the center of hot forging products both semi-processed and processed. Our hot forging process is highly delicate and has universal quality standard for car suspension parts industry,etc.